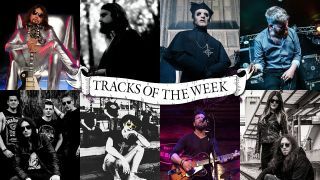 Check out this week's selection of new rock cuts, then tell us which one YOU rate highest by voting at the foot of this page. But first, who swayed your vote last week? 1. Hands Off Gretel - S.A.S.S. Continuing to prove that life outside KISS can be pretty damn good, guitar-slinger Ace Frehley comes bearing tasty fruit from his new solo album Spaceman. Mission To Mars is chock-full of meaty, groovy fuzz, plus some nicely flashy lead licks - more earthly delight than the title might suggest, in other words, but in this case that’s no band thing. Rumbling, resonating old blues and garage tones now - with a hint of the psychedelic twistiness of All Them Witches - from electric blues rock maverick John J Presley. Commanding, menacing stuff, with a hauntingly atmospheric fade-out, this one kind of darkness we could use more of in our lives. Need a pick-me-up this Monday? You’ll appreciate this highly danceable, singalong-friendly highlight from Ghost’s excellent latest album Prequelle. Like some hidden scene from the Rocky Horror Picture Show (the Riff Raff-esque host at the door, the synchronised dancing, the gore, the gloriously unbridled campness of it all…) but with more 2018-esque choreography, it’s a theatrical feather in Cardinal Copia’s extravagant cap. One of the most ‘70s-tastic new songs we’ve heard this week, this good-time tune from Chesterfield rockers The Black Hands shimmies through big, unashamed nods to Free, The Stones and Cream among others. “Go on baby, put on your leopard skin boots,” purrs singer Andy Gannon, like the 21st century never happened. “We really went old school when recording this,” Gannon says. “The drums and bass were recorded in an old shower block in a football club dressing room, to give it a natural echo.” Cool. Something softer and prettier next, from the Spokane rockers who started life as a Bowie tribute band. And there is actually a faint trace of the Starman in here, woven into a quietly stirring melody and layers of honeyed pop-rock warmth. Listen to this and more on their second album, Rebel, which is out now. Fun fact: Aussie singer/songwriter Eden James once knocked Robbie Williams off the no.1 spot in the Greek Top 40. Since then he’s not exactly exploded, but has quietly gathered fans, accolades and kudos in his homeland and elsewhere. This new single is a lovably retro mix of cool indie rock, rootsified touches and stompy glam hints.